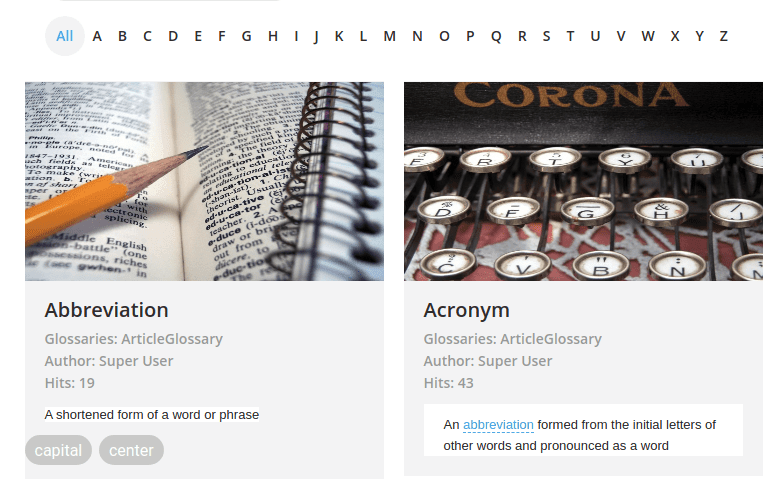 SEO Glossary is a Joomla! extension that puts definitions at your users’ tooltips. And with a fully-fledged front-end glossary supporting this feature, users can look up words with ease whenever they like using a specific page. Recently, the extension has been on the receiving end of a major update that refreshes its looks. SEO Glossary comes with five different themes - the alphabetical list, the flat, default and responsive designs, and the masonry grid. All themes have their own peculiarities - the small adaptations that allow you to choose the most befitting design for your Joomla! blog. The simplest theme is the alphabetical list. It is most appropriate if the glossary serves the purpose of a dictionary or a thesaurus; glossary entries are listed beneath each other. Each entry can be clicked and expanded for its details. Closely linked are the flat and default themes, which adopt a list layout. The former design takes minimalism seriously, with a clean design and an abundance of white space. The latter is a darker take on the flat design. The responsive theme builds atop the flat theme, but it is special because it adapts to whatever display device the reader is using to visit the blog. In this way, the design changes to accomodate the user and enhance their reading experience. And although text is the most obvious choice to explain what your website is about, pictures are much more expressive. If you rely on images to convey a message, the final theme - the masonry grid - incorporates images into a beautiful, wall-like design. Having a wide range of themes is all well and good, but how do you actually use them? Glossaries go into pages, or menu items, and the actual designs can be chosen from the advanced tab. Apart from the actual design, some themes come with additional options, like ordering and order direction. SEO Glossary 3.0 continues moving in the direction of other JoomUnited plugins with a more modern view. 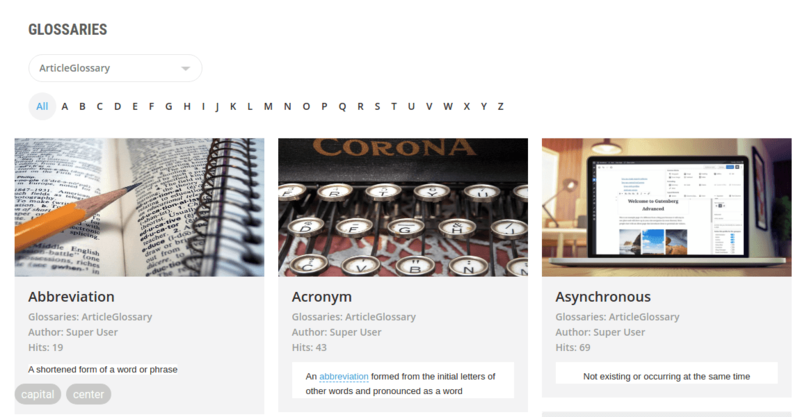 The revamped themes facilitate looking up definitions thanks to beautiful new designs. And with a variety of options, glossaries can settle in snuggly with the rest of your Joomla! blog.